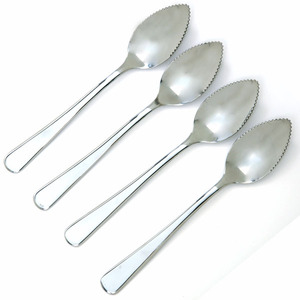 Polished stainless steel spoon with serrated edges easily loosen grapefruit sections. Dig into that juicy grapefruit with the proper utensil. Also suitable for use with oranges and kiwi fruit. Smartly styled in polished stainless steel. Measures 6.25"/16cm. Set of 4.